The general programming service channel JTBC which launched glamorously finally celebrated its first full month anniversary. 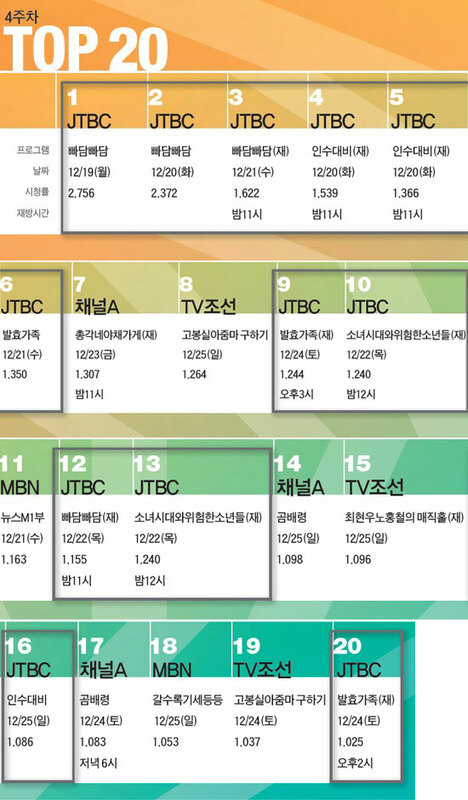 In the past 4 weeks, the channel broke highest ratings record of various departments, proving that it’s worthy of the reputation of “branded general programming service channel.” Especially within the 4 weeks, the programs of JTBC accounted for a total of 12 spots, more than half, from the top 20 highest ratings shows among the general programming service channels. The pattern was stably maintained throughout the period, as such the dramas produced by JTBC which entered the top 10 list are worthy to pay close attention to. Thank to its strength in drama and entertainment programs, JTBC channel can reach very high recognition after launched for only one month. Weekend drama Queen Insoo and Monday and Tuesday drama Padam Padam have consistently rated over 1% since premiere, and have been defined by relevant persons as the standard for “success index.” And the ratings for the dramas have kept in rising trend. Comparing with other general programming service channels, the distinctive move not only received the reputation of “masterpiece drama,” but also becomes topic of discussion. Likewise for variety shows. 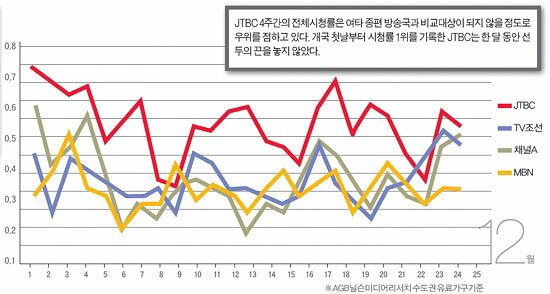 The characteristic of variety show that very hard to increase the awareness during the beginning of broadcast, making the ratings of variety shows are not as high as the dramas, but the “new format” of the shows suggests the possibility. The first project that stirred the TV series market is Queen Insoo. The launch historical drama is written by author Jeong Ha Yeon who used to wrote “Flames of Desire,” “Sin Don,” “Empress Myeongseong,” “The King and I” and other dramas, and is directed by PD Lee Tae Gon of “Smile, You” and “Last Scandal.” Chae Si Ra who used to play the role of Queen Inso in “The King and I” is not challenging the same role again after 11 years, becoming a hot topic among people. The current focus of the scenes is on Ham Eun Jung and Baek Sung Hyun, and the child actors. The scenes of Chae Si Ra is expected to start airing at mid January after 20 episodes. Earlier, at the third day of JTBC began broadcasting, the rating of premiere episode of Queen Insoo had reached 1.813%. At the rerun on December 13th, 2011, the rating even hit the high of 2%, attracting attention. People is full of expectation for the ratings to surge when Chae Si Ra debuts. The attention on Padam Padam is very hot. It is written by famous author Noh Hee Kyung and is directed by “Iris” director Kim Kyu Tae. The beautiful scenes that is even better than movie and immersible story plot has made the drama increasingly popular. On the program broadcast on December 19th, 2011, the national audience ratings for the program aired on general programming service channel exceeded 2% for the first time. The solid acting of the cast members have also won praises. Especially for Jung Woo Sung has won the praise of ‘best acting since debut’ for his interpretation of the Yang Kang Chil character, who was released from prison 16 years after been framed for murder. The handsome yet distinctive masculine expressions and gestures of the character has been second to none ideal dream lover for female viewers, and the envious of male viewers. The lead actress Han Ji Min also shows the charm of innocent and unbeatable beauty, attracting attention. “I Live in Cheongdam Dong” is a sitcom produced by entertainment division. It’s the new project for famous and skillful PD Kim Seok Yoon PD who produced movies such as “Old Miss Diary” and “Detective K.” The “national mother” Kim Hye Ja is challenging sitcom for the first time in 50 years has gained focus of attention. Singer Jo Kwan Woo also cameo in the comedy drama. The story of “ordinary people” living in “neighborhood of the rich and famous” at Cheongdam-dong brings tranquil laughter with increasing engagement with each episode. The ratings has been more than 1% consistently, and the fixed amount of viewers who watch the drama has steadily increased. The daily morning drama “When Women Powder Twice” is popular among middle-aged viewers. Danny Ahn, Lim Jung Eun, Kang Sung Jin and Ahn Jae Mo star in the series.